Home Our Systems What is Zoning? Air Conditioners work to cool or warm your home, creating a comfortable living environment by filtering the air and removing the moisture which causes humidity. Back in the day, a central air conditioning unit was used to cool or heat the house, which meant each and every room had the same temperature and amount of air flow. During this time, the temperature throughout a house was controlled by just one thermostat and to expect a single thermostat to control temperature variations throughout a home was almost impossible. As time went by and individual family members had different comfort levels, zoned temperature control was introduced whereby a system ductwork was used to control heating and cooling in each zone. Conditioned air is distributed where and when you need it, making you and your family more comfortable whilst saving you money by using less energy. Traditional zoning requires a large common zone which remains open at all times to prevent air pressure build-up and damage to the ductwork. The common zone can occupy up to 25% or more of a home, and you will pay to heat or cool it regardless of whether you use that area which creates wastage. We believe that having total control of your home air conditioning system should be a necessity and not an option. We go on the basis that different areas of your home have different air flow needs, as do individual family members. Having the ability to monitor and adjust the amount of air going into each room shouldn’t be a herculean task. 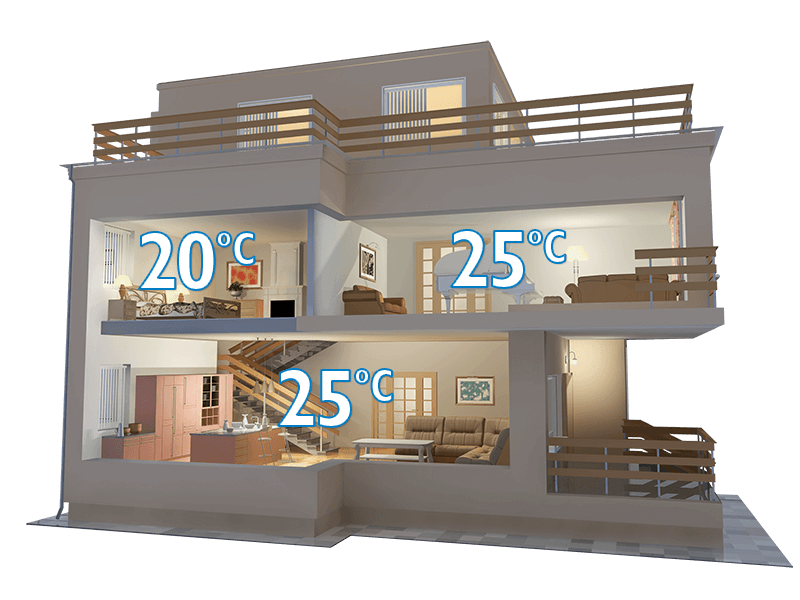 By having the right system, you will be able to adjust the airflow in each room and increase your comfort level whilst at the same time decrease cost. And so we took all this into consideration and designed three different systems to adapt and adjust to all your air-conditioning needs.